STEREO-A's "selfie" of the solar system catches Earth, Mars and Pluto's location against the Milky Way. The image was taken June 18, 2016. An incredible new time-lapse video shows Earth, Mars and the location of Pluto using images from NASA's Solar Terrestrial Relations Observatory Ahead (STEREO-A) spacecraft, with the Milky Way as a vivid background. The spacecraft, whose primary mission is to monitor solar activity, was on the far side of the sun when the pictures were taken earlier this month. The time-lapse sequence was captured while STEREO-A was performing routine operations at the time, looking at the inner heliosphere (the sun's region of influence), said Karl Battams, an astrophysicist and computational scientist based at the U.S. Naval Research Laboratory (NRL) in Washington, in an email to Space.com. The spacecraft took the photographs with its Heliospheric Imager 1 instrument, which is managed by the NRL. "While we do have Pluto labeled in the pretty pics online, it's not actually visible in them — it's far too faint and small for us to detect. Earth and Mars, obviously, are easily spotted, and we're lucky to have a stunning Milky Way backdrop again. It was arguably more beautiful a week or so ago when it was better centered in the field of view." 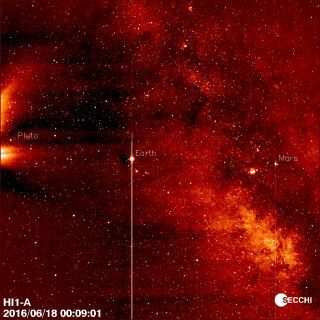 STEREO-A took the photos by using the H1 camera and other instruments in the Sun Earth Connection Coronal and Heliospheric Investigation (SECCHI) package. The H1 camera looks for solar outflows such as coronal mass ejections, when the sun ejects plasma from its surface into space. Other cameras in the package can look much closer at the sun, either by blocking its light with a coronograph, or by imaging the sun itself in the extreme ultraviolet wavelength, Battams said. STEREO-A and a twin spacecraft, STEREO-B, both launched Oct. 25, 2006. They were inserted into sun-centered orbits that trail slightly ahead of and behind the Earth. (The "A" in STEREO-A stands for "Ahead" and the "B" in STEREO-B as stands for "Behind.") With the two spacecraft taking images of the sun at the same time, NASA and the NRL were able to receive stereo data on CMEs and other solar activity. In October 2014, however, Earth lost contact with STEREO-B. At the time, controllers were resetting and testing the craft to see how well its automation would work when it was behind the sun and in poor contact with Earth. Communication has not been regained. More images from SECCHI are available online here (click on the thumbnails on the left).